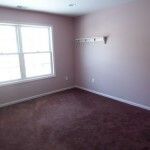 Purple Bedroom to Ooh La La on a Budget | Your home, only better. My five year old articulated it well when she first saw her new room. 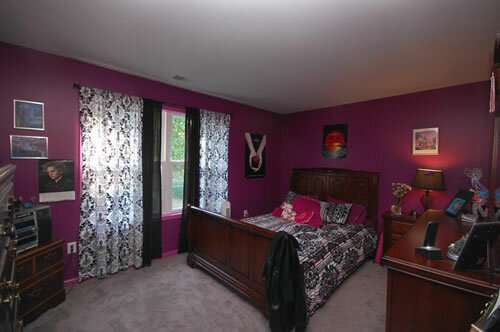 The walls and doors were dark purple, and all the trim was dark pink. Seeing how we would be the ones painting it, I thought I would throw up too. That’s a big job! 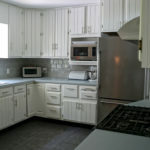 Before we could chicken out, we quickly started priming, thus committing ourselves to the project. 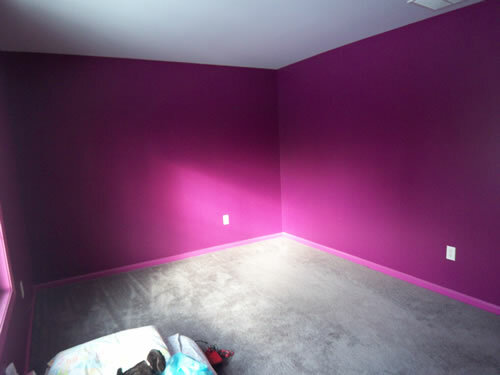 And oh yes…the closet was dark purple too. Oh joy. Our first task was to neutralize! 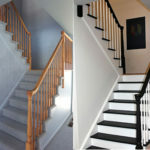 We painted the walls Benjamin Moore White Swan (same color we used in the dining room) and added new carpeting (very helpful when it came to painting the trim). 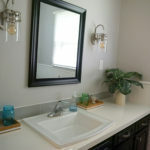 We kept the furniture neutral so we could introduce color through accessories (since she’ll probably change her mind). Now we were ready to have some fun! After negotiations with our five year old who adamantly wanted a Dunkin Donuts room, we agreed upon a girly French Café theme. We were able to mostly use what we already had by procuring a few pieces of furniture from her now-tween big sister (bookcases and writing desk). We added a couple vinyl wall clings (Eiffel tower and “Ooh la la”) and we were on our way! 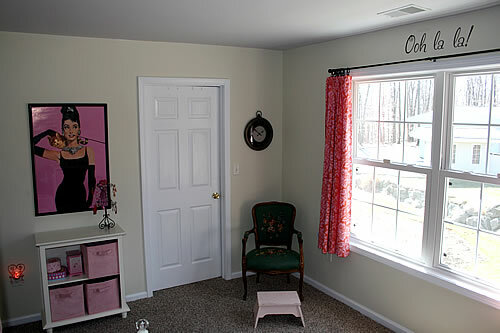 For a punch of color and sass, we included an Audrey Hepburn print and a doll-shaped jewelry holder. 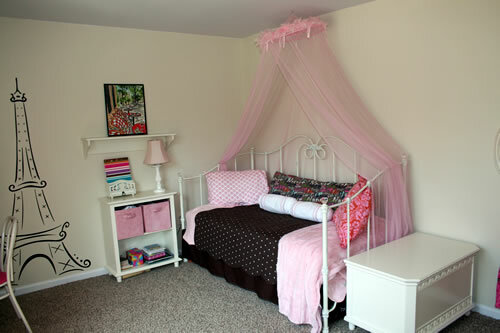 The bed was topped with a very girly canopy. 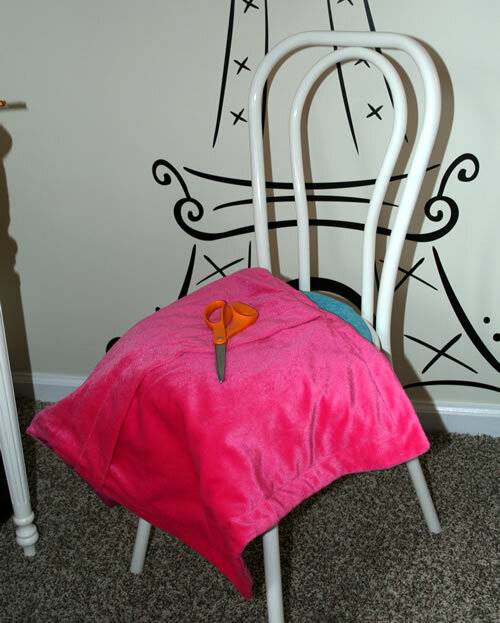 For a quick makeover of the chair at the writing desk, we repurposed a pink sham and covered the seat. BTW – I’m officially done painting pink rooms in my own house. 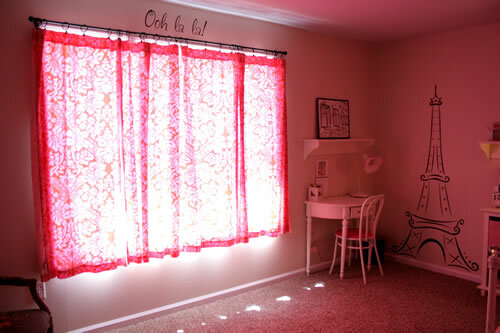 But by using pink and red curtains, the room LOOKS pink when the curtains are closed on a sunny day. Win-win! We intentionally left the room a bit on the simple side on purpose. 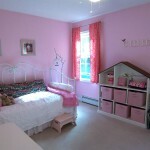 As she grows, she’ll want to add her own personal stamp to this room. Plus I’m still on the hunt for a small bistro table and two chairs to place in front of the window. I’ll let you know if I find it! But first I should probably figure out how to fill the furniture void in my 10 year old’s room since we took most of her storage pieces! 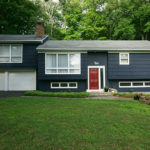 She went for a much more modern look – check it out! I would like to know which store you bought your sofa bed? We actually found that day bed on pbteen.com on clearance for only $200. It’s always worth it to stalk the sale section! This is so great. love your ideas.. and your budget! You’ve got a new follower. so great. love your ideas.. and your budget! I just love the curtains that you used and how the lights strike it. Its also a good thing that you only spent a little amount for this project. Great job for putting it all together! Thanks…I’m all about frugal – lol! 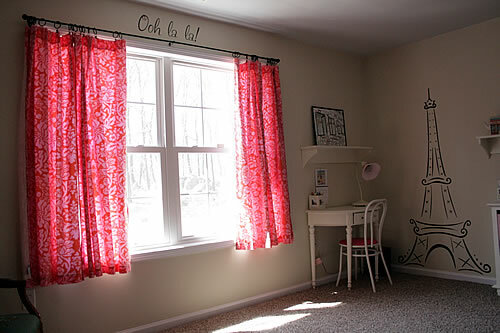 Those pink curtains were the only curtains we brought from the “old” house, and luckily they fit perfectly! $ 200 for the material is amazing! $80 for the paint [incl. primer? – to cover the dark purple paint] is not bad either. how much was the carpet? i d love to come to know, how much time you have put into each of these projects, as well. many people cannot imagine the time the creative process [material selection, space planning etc. 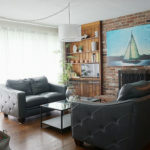 ], research the material and furniture, light fixtures, carpet, wallpaper etc., and shop the things, online or offline – either way! [takes time too! ;)] to redecorate a room. The design itself was a consensus between me and my pink-lovin’ 5 year old. It really only took a few accents to give the room it’s flavor. Now let’s see how we get through the teen years!